I seriously love a good pizza. 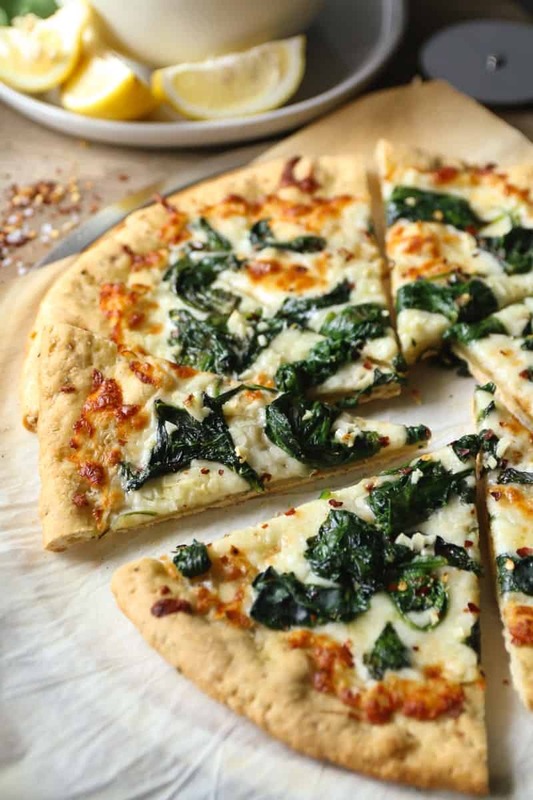 This White Pizza with Spinach and Garlic is no exception. A surprise ingredient at the end adds just the right touch! *I’ve teamed up with Chebe Bread to make this recipe. They provided me with the mix but the recipe and opinions are all my own. Ever since going gluten-free this past January, the main thing I can’t seem to find a good replacement for is pizza. Good pizza when you’re gluten-free, is hard to find! #thestruggleisreal I’ve tried so many mixes, frozen crusts, & home-made blends. Not one gave me that crunchy crust and chewy-ish center reminiscent of traditional pizza. That darn gluten seems to have cornered the market on good pizza! I’m happy to say though, that the Chebe Bread Pizza Crust Mix (affiliate link) has provided me with the closest thing yet to the traditional pizza I miss so much! The crust got super crunchy and yet the center was still quite chewy! I called it a win! My husband tried it and agreed, it was the best option we’ve tried so far. Win, win! Since I knew no one else would really be eating the pizza with me, I went full on fancy. 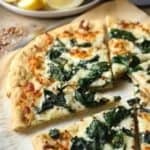 There’s no way you’d catch my kids eating white pizza with spinach and garlic, but I’ve always loved making this pizza for myself. While recipe testing, I discovered two tips for using the Chebe Pizza Crust: 1. pre-bake the dough and 2. don’t forget to poke holes with a fork! I skipped that step the first time and I had such a large hole, it was hard to put toppings on it! But I did wonder if it could somehow make a good pita! Did someone say falafel? 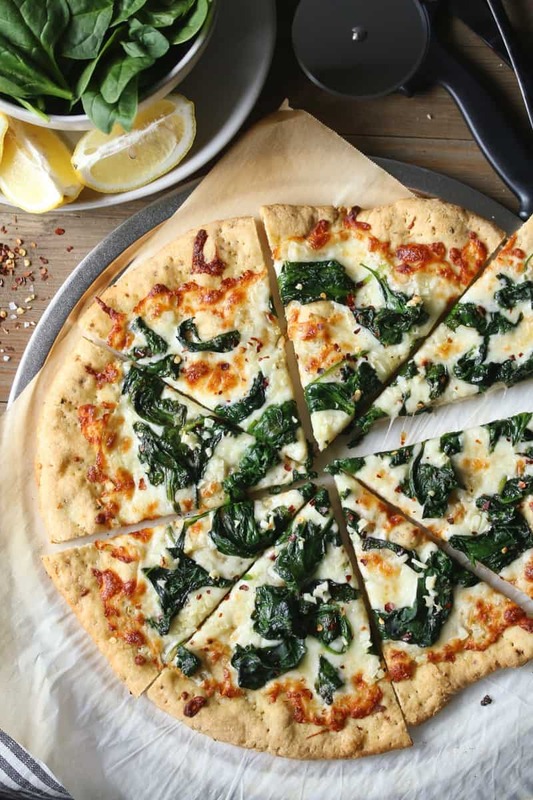 While this pizza looks fancy, it could not be simpler to make! 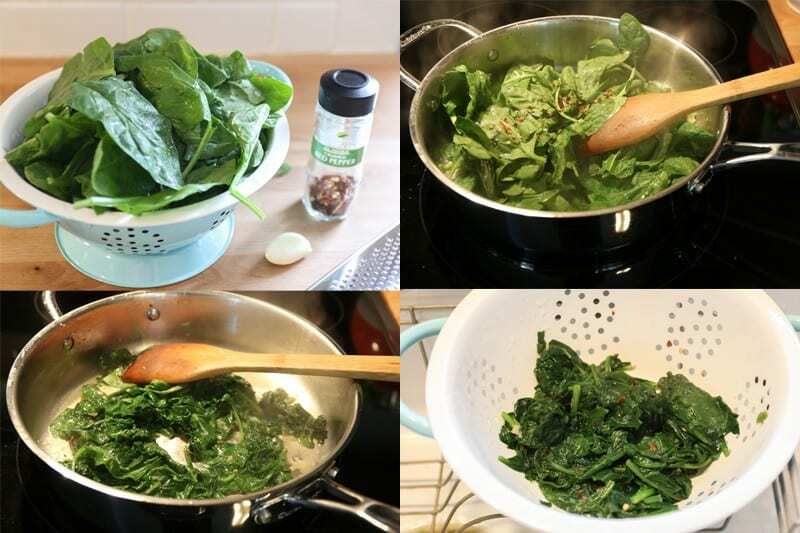 First things first, sauté the spinach. This takes like 2 minutes. I added some garlic and red pepper flakes. 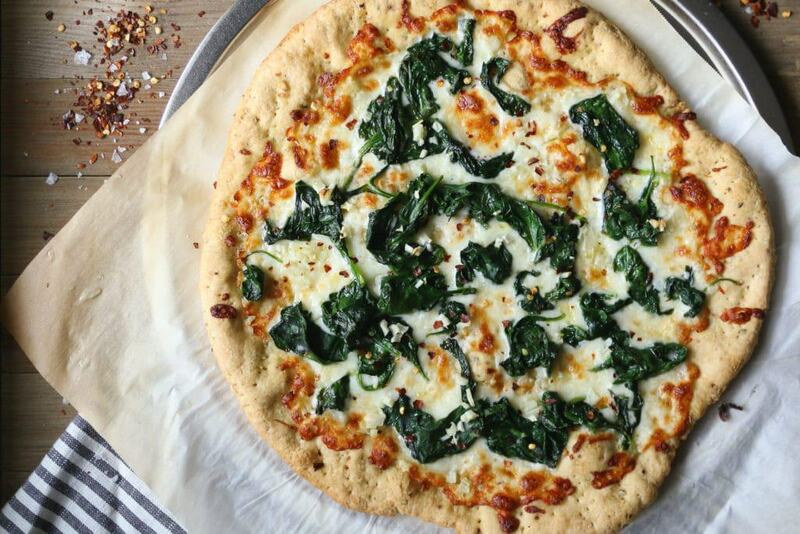 Once you’ve sautéed the spinach, you’ll get the dough ready. Which was also very simple! Mix the dough, then knead for a couple minutes. Roll it out on parchment paper and pre-bake it. Once it is done with the pre-bake, it’s time for toppings. Brush it with a tad more olive oil, then layer on the cheese, spinach, and chopped garlic. After that, it goes back in the oven to finish baking. When it comes out of the oven, finish it off with red pepper flakes and a squeeze of lemon! Yes, lemon! It adds just the right touch! Check out the full recipe below! I can’t wait to have some more fun with Chebe Bread Mixes. They are really easy to use and quite unique compared to other mixes I’ve found so far. Plus not only are they naturally gluten-free, they’re also certified gluten-free, which to me is a huge bonus! A super flavorful pizza without sauce! Sauce, who needs it?! Pour the dough mixture onto the counter or clean surface. 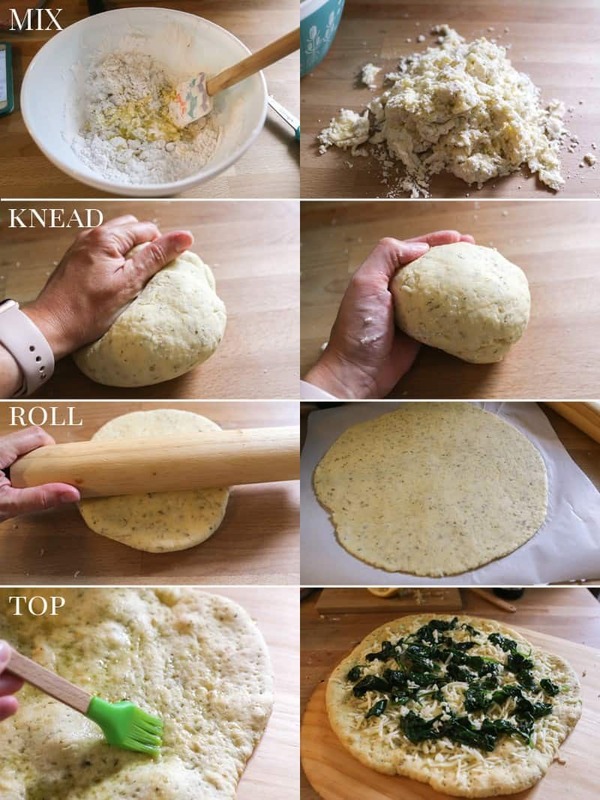 Knead the dough with the palm of your hands until it comes together to form a smooth ball. Remove from the oven and sprinkle with a pinch of red pepper flakes. Squeeze the lemon juice all over the top. Slice and enjoy!